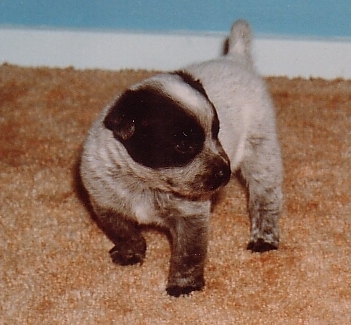 Tiger was mostly a blue cattle dog. He was a great family pet. He was very protective of me and my brother when we were young. I still remember when my dad gave us these little cameras, and my brother and I used to sit on the veranda and take pictures of each other cuddling him. He looked so cute. I still remember when my brother and I were in the pool and Tiger was running up and down on the ground beside the pool barking his head off. He was barking because he thought we were drowning, but we weren't. He wanted to jump in the pool to get us out but he was too afraid of the water. At one stage he did end up jumping in the pool. Tiger used to tell us when the postman came. 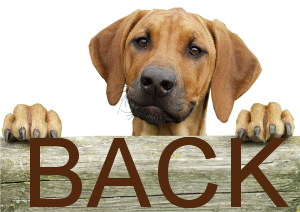 He would sit and rest on one side of the house and when he saw the postman coming to our house he would bolt and start barking until he reached the other side of the house. When my brother got into trouble, he would dive into the kennel with Tiger. My Mum couldn't get to him because Tiger was guarding him. My brother when he was small would ride his skate board down the path along side the house and Tiger would race in front of him thinking that he was going to crash and he would stop him by jumping in front of him. He was ever so protective. He would sit in the sun outside the kitchen window watching my Mum at the kitchen sink and he could hear his dog food in a tin being opened so could be fed each day and would wag his tail and just patiently wait for his food to be placed outside to demolish it. He knew the local people and only barked when strangers were about, he was such an excellent watch dog. His bath time was an real event and my Dad would have to put him on a leash to led him to a shower recess and Dad would hop in the shower recess and wash him. He smelt so clean and after would race straight outside and roll in the grass or dirt just for fun., just to dry himself off. Sadly Tiger died very suddenly in August 92. We all miss him very much. 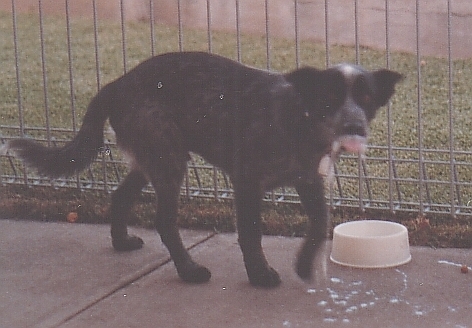 This is Bosco the dog we got a few months later and he died December 1992 suddenly at 6 weeks. So we went for birds. 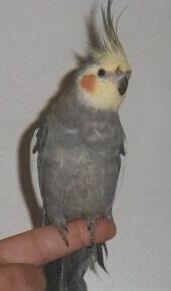 Midge came to us as egg his mum would not look after in 1995 and he was the charmer of the two birds and loved to be with us all even if he is in the cage. He sadly died early 2003. Petrie on the other hand does not like to be handled unless by me and chats and talks all day. In the mating season they both become quite feisty and try to mate in our hair and nest in there. He was always very talkative. We let them out two times a day and that gives them time to fly and plenty of room for them to spread their wings. Petrie died 2 June 2010 aged 15. We bought another puppy that we have named him Rusty. 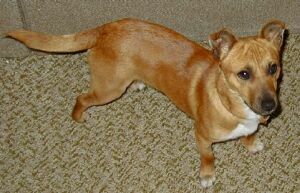 He is cross between Corgi and Fox Terrier and of course he is Rusty colour. He loves to sleep most of the day and when we come home from school he goes crazy. I take him for a walk each day. Saturday is his bath day. He is not too fond of this but alas it has to be done. He has escaped a few times and we have spent quite a bit to 'rust proof' our home, so he does not get out. At times when we are out for long periods he whimpers and tears some old towels from the clothes line and chews them up a bit. Sometimes he just takes them off the line and drags them around the yard. He sulks a bit and it seems to be a pay back because we left alone. He is definitely a people dog. He has won all our hearts and has fitted in perfectly with our family. 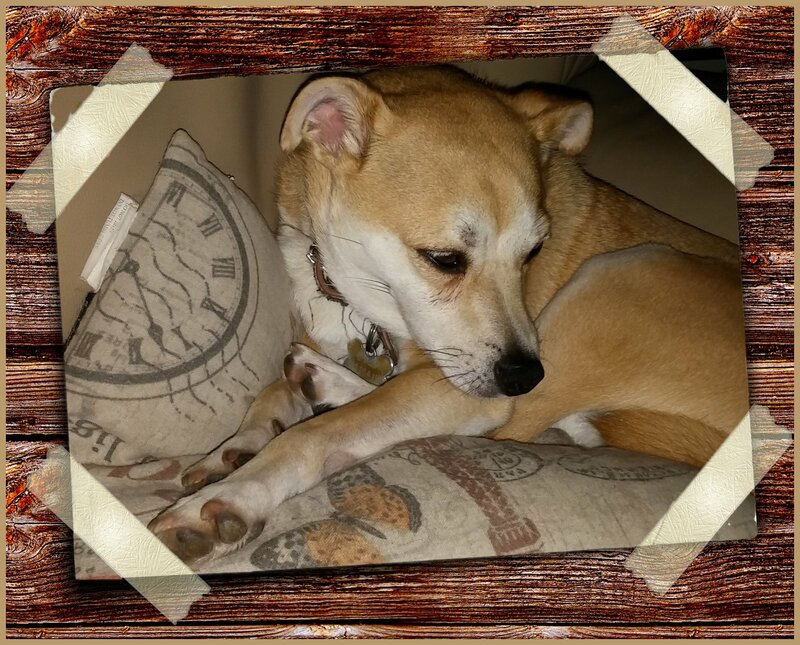 Rusty has a very gentle nature and he has entered out lives and enchanted our family with his charm. How could you resist those big brown eyes?? UPDATE: RIP Rusty June 2010 his new page is here. We had big bird cage outside that my Dad built that houses finches, cockatiels, budgies. Inside we have Midge the cockatiel and Petrie the budgie and our fish of course making our house a complete PET HAVEN. UPDATE: Now all the fish have died. They did take a lot of taking care of with the cleaning up of their messy cages and giving them seed and water daily. I also fed the local birds with some of their proper seed and we grow plenty of native bushes for the native birds that adorn our trees. We have black, pink and white Cockatoos, red Rosellas, Galahs, Kookaburras, and Lorikeets. So you can see we are right amongst the action. Midge and Petrie always were inside our house all the time in their cages and put outside in good weather. 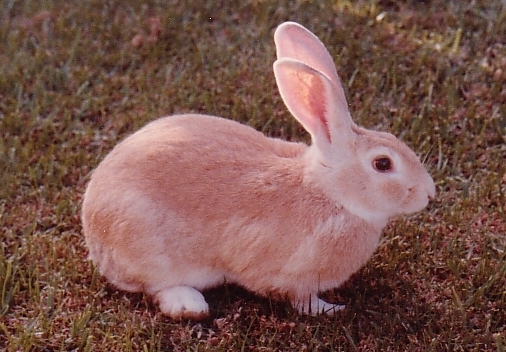 Nibbles was the pet rabbit of my family before I was born. Ocar has been with us since 2010. He was wild when he came to us as a rescue dog, but now he is happy to sleep all day. He has well and truely stole our hearts. He know what we are thinking and like many dogs reads our mind and knows many words. He responds to sounds and know what we are doing with each move. When it is cold and wet, please take me inside, for I am now a domesticated animal, no longer used to bitter elements, and I ask no greater glory than the privilege of sitting at your feet beside the hearth. Though had you no home, I would rather follow you through ice and snow than rest upon the softest pillow in the warmest home in all the land, I am your devoted worshipper. Feed me clean food, that I may be well, to romp and play and do your bidding, to walk by your side, and stand ready, willing and able to protect you with my life should your life be in danger. And, beloved master, should the Great Master see fit to deprive me of my health or sight, do not turn me away from you. Rather hold me gently in your arms as skilled hands grant me the merciful boon of eternal rest... and I will leave you knowing with the last breath I drew, my fate was ever safest in your hands. Oscar came to our family in 2010. He was quite wild as a puppy and trashed teh usual things around the house. He now just scatters our scatter cushions and shred newspapers whilst he is bored when we leave the house. However 2016 he is a lounge/bed doggie. He follows me outside and watched me till I come back inside. He is barking still when people walk near our house or if someone comes to the door. A great guard dog. 1. My life is likely to last 10-15 years. Any separation from you will be painful for me. So please remember this when you get me. 2. Give me time to understand what is that you want of me. 4. Don't be angry with me for long, don't lock me up as punishment. You have your work, school, entertainment and friends. I have only you. 5 Talk to me sometimes. Even if I don't understand your words, I understand your voice. 6. Be aware that however you treat me, I will never forget. 7. Before you hit me, remember I have teeth that could easily crunch the bones in your hand, but that I choose not to bite or hurt you. 8. Before you scold me for being uncooperative, obstinate, or lazy, ask yourself what might be bothering me. Perhaps I'm not getting the right food. I may have been out in the sun too long. My heart may be getting old and weak. 9. Take good care of me when I am old. You too will grow old. 10. Remember that I love you. Life is better for me because you are there.